I am a fan of the gâteau Basque. In fact, I’ve made a couple of rather traditional versions here before, both filled with pastry cream and jammy fruit. This Gâteau Basque Fantasie is Dorie’s fall fantasy version. It has that great cookie-like double crust (seriously, so good! 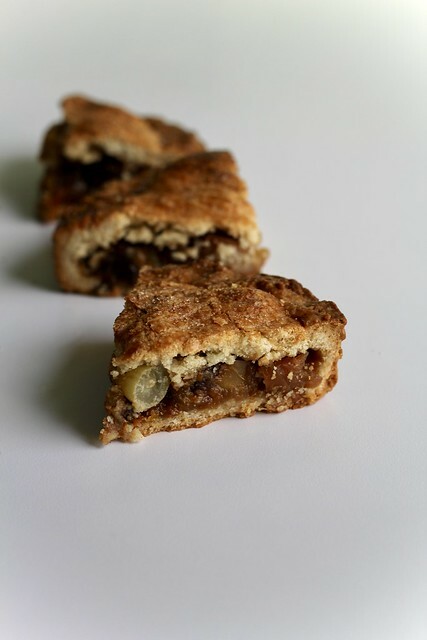 ), filled with a cooked down mix of apples, grapes, lots of orange and dried fruit and nuts. It reminds me of mince pie, and I like it a lot. You can act out your own fantasies and switch things up, too. I imagine pears would be great in place of the apples, and you can change the spicing to be whatever you want it to be. The pastry dough seems a little fussy to work with. It’s soft and cracks easily. But really, it’s super forgiving because all that seems to disappear in the oven. Any imperfections come out looking perfectly beautiful, even if you feel you’ve done a rather kooky patch job getting it into the pan. Don’t skip the egg wash and the pretty crosshatch pattern. Of course these are just my fantasy additions, but may I also suggest a scoop of vanilla ice cream and a little glass of vin santo? 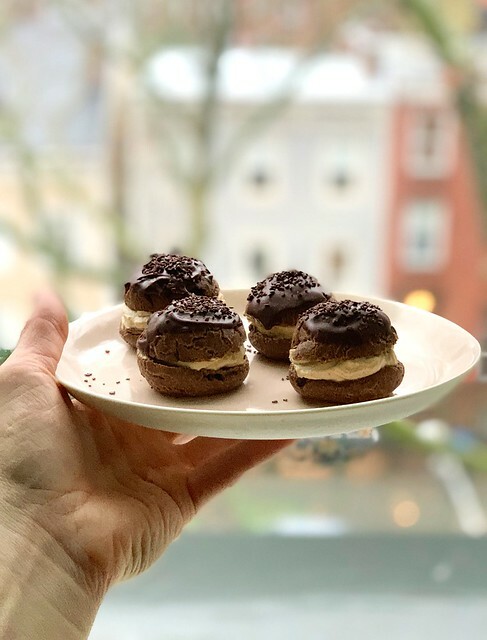 Okay, so this recipe isn’t from BWJ, BCM or even BFMHTY, but it is from another Dorie book, Around my French Table, so I’m trying to pass it off as a rewind this week and hope no one calls me out on it. Also, I’ve made it before, but I liked it enough to play around with it again. I don’t have a lot of new insight or commentary to add here. It’s still so tasty! 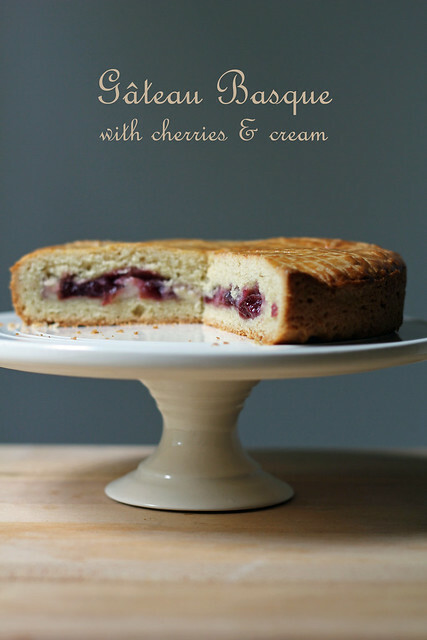 I just wanted to show that, even though cherries (which I used last time) are the traditional Gâteau Basque fruit filling, you don’t have to be bound by tradition. Here, along with pastry cream, I used roasted strawberries that I had leftover from last week’s shortcake. The delicious cookie-like double crust would be great sandwiching so many different fruits. Using fruit that’s cooked in some way, whether that be candied, roasted, jammed or sauced, is most ideal, since the fruit is concentrated and you’ll have less liquid seeping into the crust. I plan to try jammy plums next time. Somehow I almost never miss a week of TWD but I hadn’t made an FFWD recipe in like forever. When I saw that Gâteau Basque was up, I thought it would be a good time to pop back around and say hello. Not surprisingly, Gâteau Basque is a traditional pastry of the French Basque Country. You can read up on it here and here, but it’s basically a layer of either pastry cream or cherry jam sandwiched between two almost cookie-like tart crusts. Hmmm…I wonder if it was the inspiration for Dorie’s Not-Just-For-Thanksgiving Cranberry Shortbread Cake? 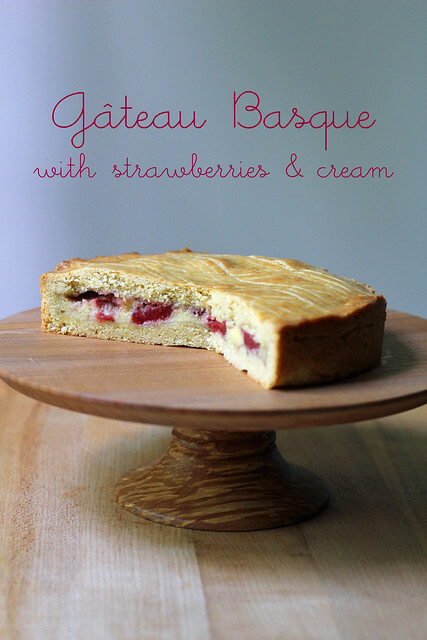 We made Gâteau Basque on weekends at the shop where I used to work (and they probably still do). We used a bit of almond flour and almond extract in our dough there, so I had assumed that flavoring was traditional…but that’s not in Dorie’s version, so maybe it’s not. Sometimes less is more, but sometimes more is more, so at the shop we always filled ours with pastry cream and fruit. I can admit that I’m a little greedy when it comes to sweets, and “more is more” is the way I like it, so that’s what I did here at home, too. I didn’t have cherry jam but I did have some dark cherries that I candied a couple of weeks ago…I dropped them on top of the pastry cream and they worked nicely. This is pretty easy to make, and you can bust out all the components a day ahead of time. The dough is sticky, but forgiving, and you can even more or less pat it into the round shapes you need without too much rolling. 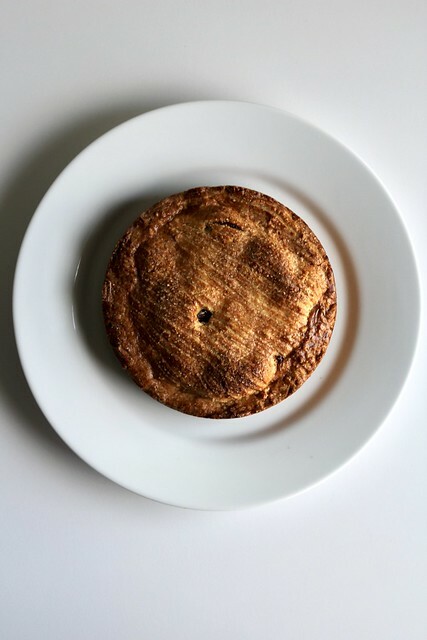 It’s really delicious, and beautiful, too, with a pretty crosshatch pattern on top of the golden crust. For the recipe, see Around my French Table by Dorie Greenspan (it’s also here). Don’t forget to check out my fellow francophiles’ posts.